Building Better Models with JMP® Pro provides an example-based introduction to business analytics, with a proven process that guides you in the application of modeling tools and concepts. It gives you the "what, why, and how" of using JMP® Pro for building and applying analytic models. This book is designed for business analysts, managers, and practitioners who may not have a solid statistical background, but need to be able to readily apply analytic methods to solve business problems. In addition, this book will greatly benefit faculty members who teach any of the following subjects at the lower to upper graduate level: predictive modeling, data mining, and business analytics. Novice to advanced users in business statistics, business analytics, and predictive modeling will find that it provides a peek inside the black box of algorithms and the methods used. Topics include: regression, logistic regression, classification and regression trees, neural networks, model cross-validation, model comparison and selection, and data reduction techniques. 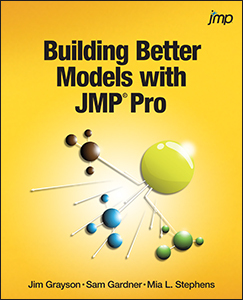 Full of rich examples, Building Better Models with JMP® Pro is an applied book on business analytics and modeling that introduces a simple methodology for managing and executing analytics projects. No prior experience with JMP® is needed. Make more informed decisions from your data using this newest JMP® book. Please Login or Register to start earning rewards.